New Single: “Schlawiener” – Out on April, 23! A signed CD or white vinyl, Schlawienermelange spice blend, sticker and poster! “Schlawiener” is a cheeky play on words in German, translating roughly as a “smooth operator/dodger living in Vienna”. Someone you almost automatically turn into when moving from a hanseatic city (Hamburg in this case) to the foothills of the Balkans (and stay there for more than a decade). On this fresh-from-the-oven release, Mr. Dunkelbunt takes the mic himself, rapping about Vienna the way he sees it… and his life as a traveller & jetlag junkie. As far as the music goes, the artist calls it “HipHop-rattle-electro-swing mixed in with funky-sirtaki-dubstep on a eastern tip“. Just in case you wondered. Ulf Lindemann aka [dunkelbunt] has been labelled “a wizzard of tone colours“ and “specialist for exquisite music- & spice blends“. Only just a few years ago, his highly acclaimed longplayer “Morgenlandfahrt“ got him global prestige as a pioneer producer of all things electro swing/Balkan beats. 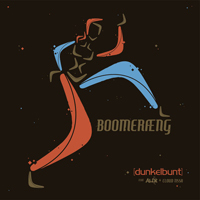 Since 2011, [dunkelbunt] also tours the planet as a brilliant live act, joined by the Secret Swing Society for that occasion. Lindemann lives & works in the lovely city of Vienna as a freelance artist since 2001… which of course makes him a true “Schlawiener“! spezialisiert aufs Wohl von Seele, Geist und Ohren.